It has been suggested that 3D data acquisition and object reconstruction be merged into this article. (Discuss) Proposed since September 2018. 3D scanning is the process of analyzing a real-world object or environment to collect data on its shape and possibly its appearance (e.g. colour). The collected data can then be used to construct digital 3D models. A 3D scanner can be based on many different technologies, each with its own limitations, advantages and costs. Many limitations in the kind of objects that can be digitised are still present. for example, optical technology may encounter many difficulties with shiny, reflective or transparent objects. For example, industrial computed tomography scanning and structured-light 3D scanners can be used to construct digital 3D models, without destructive testing. Collected 3D data is useful for a wide variety of applications. These devices are used extensively by the entertainment industry in the production of movies and video games, including virtual reality. Other common applications of this technology include augmented reality, motion capture, gesture recognition, industrial design, orthotics and prosthetics, reverse engineering and prototyping, quality control/inspection and the digitization of cultural artifacts. The purpose of a 3D scanner is usually to create a 3D model. This 3D model consists of a point cloud of geometric samples on the surface of the subject. These points can then be used to extrapolate the shape of the subject (a process called reconstruction). If colour information is collected at each point, then the colours on the surface of the subject can also be determined. 3D scanners share several traits with cameras. Like most cameras, they have a cone-like field of view, and like cameras, they can only collect information about surfaces that are not obscured. While a camera collects colour information about surfaces within its field of view, a 3D scanner collects distance information about surfaces within its field of view. The "picture" produced by a 3D scanner describes the distance to a surface at each point in the picture. This allows the three dimensional position of each point in the picture to be identified. For most situations, a single scan will not produce a complete model of the subject. Multiple scans, even hundreds, from many different directions are usually required to obtain information about all sides of the subject. These scans have to be brought into a common reference system, a process that is usually called alignment or registration, and then merged to create a complete 3D model. This whole process, going from the single range map to the whole model, is usually known as the 3D scanning pipeline. There are a variety of technologies for digitally acquiring the shape of a 3D object. A well established classification divides them into two types: contact and non-contact. Non-contact solutions can be further divided into two main categories, active and passive. There are a variety of technologies that fall under each of these categories. 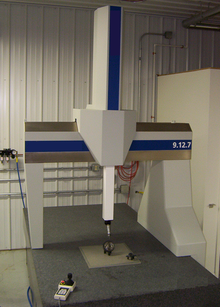 A coordinate measuring machine with rigid perpendicular arms. Contact 3D scanners probe the subject through physical touch, while the object is in contact with or resting on a precision flat surface plate, ground and polished to a specific maximum of surface roughness. Where the object to be scanned is not flat or can not rest stably on a flat surface, it is supported and held firmly in place by a fixture. A carriage system with rigid arms held tightly in perpendicular relationship and each axis gliding along a track. Such systems work best with flat profile shapes or simple convex curved surfaces. An articulated arm with rigid bones and high precision angular sensors. The location of the end of the arm involves complex math calculating the wrist rotation angle and hinge angle of each joint. This is ideal for probing into crevasses and interior spaces with a small mouth opening. A combination of both methods may be used, such as an articulated arm suspended from a traveling carriage, for mapping large objects with interior cavities or overlapping surfaces. A CMM (coordinate measuring machine) is an example of a contact 3D scanner. It is used mostly in manufacturing and can be very precise. The disadvantage of CMMs though, is that it requires contact with the object being scanned. Thus, the act of scanning the object might modify or damage it. This fact is very significant when scanning delicate or valuable objects such as historical artifacts. The other disadvantage of CMMs is that they are relatively slow compared to the other scanning methods. Physically moving the arm that the probe is mounted on can be very slow and the fastest CMMs can only operate on a few hundred hertz. In contrast, an optical system like a laser scanner can operate from 10 to 500 kHz. Other examples are the hand driven touch probes used to digitise clay models in computer animation industry. Active scanners emit some kind of radiation or light and detect its reflection or radiation passing through object in order to probe an object or environment. Possible types of emissions used include light, ultrasound or x-ray. time: 3.3 picoseconds (approx.) is the time taken for light to travel 1 millimetre. The laser range finder only detects the distance of one point in its direction of view. Thus, the scanner scans its entire field of view one point at a time by changing the range finder's direction of view to scan different points. The view direction of the laser range finder can be changed either by rotating the range finder itself, or by using a system of rotating mirrors. The latter method is commonly used because mirrors are much lighter and can thus be rotated much faster and with greater accuracy. Typical time-of-flight 3D laser scanners can measure the distance of 10,000~100,000 points every second. Time-of-flight devices are also available in a 2D configuration. This is referred to as a time-of-flight camera. Principle of a laser triangulation sensor. Two object positions are shown. Triangulation based 3D laser scanners are also active scanners that use laser light to probe the environment. With respect to time-of-flight 3D laser scanner the triangulation laser shines a laser on the subject and exploits a camera to look for the location of the laser dot. Depending on how far away the laser strikes a surface, the laser dot appears at different places in the camera's field of view. This technique is called triangulation because the laser dot, the camera and the laser emitter form a triangle. The length of one side of the triangle, the distance between the camera and the laser emitter is known. The angle of the laser emitter corner is also known. The angle of the camera corner can be determined by looking at the location of the laser dot in the camera's field of view. These three pieces of information fully determine the shape and size of the triangle and give the location of the laser dot corner of the triangle. In most cases a laser stripe, instead of a single laser dot, is swept across the object to speed up the acquisition process. The National Research Council of Canada was among the first institutes to develop the triangulation based laser scanning technology in 1978. Time-of-flight and triangulation range finders each have strengths and weaknesses that make them suitable for different situations. The advantage of time-of-flight range finders is that they are capable of operating over very long distances, on the order of kilometres. These scanners are thus suitable for scanning large structures like buildings or geographic features. The disadvantage of time-of-flight range finders is their accuracy. Due to the high speed of light, timing the round-trip time is difficult and the accuracy of the distance measurement is relatively low, on the order of millimetres. Triangulation range finders are exactly the opposite. They have a limited range of some meters, but their accuracy is relatively high. The accuracy of triangulation range finders is on the order of tens of micrometers. Time-of-flight scanners' accuracy can be lost when the laser hits the edge of an object because the information that is sent back to the scanner is from two different locations for one laser pulse. The coordinate relative to the scanner's position for a point that has hit the edge of an object will be calculated based on an average and therefore will put the point in the wrong place. When using a high resolution scan on an object the chances of the beam hitting an edge are increased and the resulting data will show noise just behind the edges of the object. Scanners with a smaller beam width will help to solve this problem but will be limited by range as the beam width will increase over distance. Software can also help by determining that the first object to be hit by the laser beam should cancel out the second. At a rate of 10,000 sample points per second, low resolution scans can take less than a second, but high resolution scans, requiring millions of samples, can take minutes for some time-of-flight scanners. The problem this creates is distortion from motion. Since each point is sampled at a different time, any motion in the subject or the scanner will distort the collected data. Thus, it is usually necessary to mount both the subject and the scanner on stable platforms and minimise vibration. Using these scanners to scan objects in motion is very difficult. Recently, there has been research on compensating for distortion from small amounts of vibration and distortions due to motion and/or rotation. When scanning in one position for any length of time slight movement can occur in the scanner position due to changes in temperature. If the scanner is set on a tripod and there is strong sunlight on one side of the scanner then that side of the tripod will expand and slowly distort the scan data from one side to another. Some laser scanners have level compensators built into them to counteract any movement of the scanner during the scan process. In a conoscopic system, a laser beam is projected onto the surface and then the immediate reflection along the same ray-path are put through a conoscopic crystal and projected onto a CCD. The result is a diffraction pattern, that can be frequency analyzed to determine the distance to the measured surface. The main advantage with conoscopic holography is that only a single ray-path is needed for measuring, thus giving an opportunity to measure for instance the depth of a finely drilled hole. Hand-held laser scanners create a 3D image through the triangulation mechanism described above: a laser dot or line is projected onto an object from a hand-held device and a sensor (typically a charge-coupled device or position sensitive device) measures the distance to the surface. Data is collected in relation to an internal coordinate system and therefore to collect data where the scanner is in motion the position of the scanner must be determined. The position can be determined by the scanner using reference features on the surface being scanned (typically adhesive reflective tabs, but natural features have been also used in research work) or by using an external tracking method. External tracking often takes the form of a laser tracker (to provide the sensor position) with integrated camera (to determine the orientation of the scanner) or a photogrammetric solution using 3 or more cameras providing the complete six degrees of freedom of the scanner. Both techniques tend to use infra red light-emitting diodes attached to the scanner which are seen by the camera(s) through filters providing resilience to ambient lighting. Data is collected by a computer and recorded as data points within three-dimensional space, with processing this can be converted into a triangulated mesh and then a computer-aided design model, often as non-uniform rational B-spline surfaces. Hand-held laser scanners can combine this data with passive, visible-light sensors — which capture surface textures and colors — to build (or "reverse engineer") a full 3D model. Structured-light 3D scanners project a pattern of light on the subject and look at the deformation of the pattern on the subject. The pattern is projected onto the subject using either an LCD projector or other stable light source. A camera, offset slightly from the pattern projector, looks at the shape of the pattern and calculates the distance of every point in the field of view. Structured-light scanning is still a very active area of research with many research papers published each year. Perfect maps have also been proven useful as structured light patterns that solve the correspondence problem and allow for error detection and error correction. [See Morano, R., et al. "Structured Light Using Pseudorandom Codes," IEEE Transactions on Pattern Analysis and Machine Intelligence. The advantage of structured-light 3D scanners is speed and precision. Instead of scanning one point at a time, structured light scanners scan multiple points or the entire field of view at once. Scanning an entire field of view in a fraction of a second reduces or eliminates the problem of distortion from motion. Some existing systems are capable of scanning moving objects in real-time. VisionMaster creates a 3D scanning system with a 5-megapixel camera – 5 million data points are acquired in every frame. A real-time scanner using digital fringe projection and phase-shifting technique (certain kinds of structured light methods) was developed, to capture, reconstruct, and render high-density details of dynamically deformable objects (such as facial expressions) at 40 frames per second. Recently, another scanner has been developed. Different patterns can be applied to this system, and the frame rate for capturing and data processing achieves 120 frames per second. It can also scan isolated surfaces, for example two moving hands. By utilising the binary defocusing technique, speed breakthroughs have been made that could reach hundreds  to thousands of frames per second. Modulated light 3D scanners shine a continually changing light at the subject. Usually the light source simply cycles its amplitude in a sinusoidal pattern. A camera detects the reflected light and the amount the pattern is shifted by determines the distance the light travelled. Modulated light also allows the scanner to ignore light from sources other than a laser, so there is no interference. Computed tomography (CT) is a medical imaging method which generates a three-dimensional image of the inside of an object from a large series of two-dimensional X-ray images, similarly Magnetic resonance imaging is another medical imaging technique that provides much greater contrast between the different soft tissues of the body than computed tomography (CT) does, making it especially useful in neurological (brain), musculoskeletal, cardiovascular, and oncological (cancer) imaging. These techniques produce a discrete 3D volumetric representation that can be directly visualised, manipulated or converted to traditional 3D surface by mean of isosurface extraction algorithms. Although most common in medicine, Industrial computed tomography, Microtomography and MRI are also used in other fields for acquiring a digital representation of an object and its interior, such as non destructive materials testing, reverse engineering, or studying biological and paleontological specimens. Passive 3D imaging solutions do not emit any kind of radiation themselves, but instead rely on detecting reflected ambient radiation. Most solutions of this type detect visible light because it is a readily available ambient radiation. Other types of radiation, such as infra red could also be used. Passive methods can be very cheap, because in most cases they do not need particular hardware but simple digital cameras. Stereoscopic systems usually employ two video cameras, slightly apart, looking at the same scene. By analysing the slight differences between the images seen by each camera, it is possible to determine the distance at each point in the images. This method is based on the same principles driving human stereoscopic vision. Photometric systems usually use a single camera, but take multiple images under varying lighting conditions. These techniques attempt to invert the image formation model in order to recover the surface orientation at each pixel. Silhouette techniques use outlines created from a sequence of photographs around a three-dimensional object against a well contrasted background. These silhouettes are extruded and intersected to form the visual hull approximation of the object. With these approaches some concavities of an object (like the interior of a bowl) cannot be detected. There are other methods that, based on the user assisted detection and identification of some features and shapes on a set of different pictures of an object are able to build an approximation of the object itself. This kind of techniques are useful to build fast approximation of simple shaped objects like buildings. Various commercial packages are available like D-Sculptor, iModeller, Autodesk ImageModeler, 123DCatch or PhotoModeler. This sort of 3D imaging solution is based on the principles of photogrammetry. It is also somewhat similar in methodology to panoramic photography, except that the photos are taken of one object on a three-dimensional space in order to replicate it instead of taking a series of photos from one point in a three-dimensional space in order to replicate the surrounding environment. The point clouds produced by 3D scanners and 3D imaging can be used directly for measurement and visualisation in the architecture and construction world. Most applications, however, use instead polygonal 3D models, NURBS surface models, or editable feature-based CAD models (aka Solid models). Polygon mesh models: In a polygonal representation of a shape, a curved surface is modeled as many small faceted flat surfaces (think of a sphere modeled as a disco ball). Polygon models—also called Mesh models, are useful for visualisation, for some CAM (i.e., machining), but are generally "heavy" ( i.e., very large data sets), and are relatively un-editable in this form. Reconstruction to polygonal model involves finding and connecting adjacent points with straight lines in order to create a continuous surface. Many applications, both free and nonfree, are available for this purpose (e.g. MeshLab, PointCab, kubit PointCloud for AutoCAD, JRC 3D Reconstructor, imagemodel, PolyWorks, Rapidform, Geomagic, Imageware, Rhino 3D etc.). Surface models: The next level of sophistication in modeling involves using a quilt of curved surface patches to model the shape. These might be NURBS, TSplines or other curved representations of curved topology. Using NURBS, the spherical shape becomes a true mathematical sphere. Some applications offer patch layout by hand but the best in class offer both automated patch layout and manual layout. These patches have the advantage of being lighter and more manipulable when exported to CAD. Surface models are somewhat editable, but only in a sculptural sense of pushing and pulling to deform the surface. This representation lends itself well to modelling organic and artistic shapes. Providers of surface modellers include Rapidform, Geomagic, Rhino 3D, Maya, T Splines etc. Solid CAD models: From an engineering/manufacturing perspective, the ultimate representation of a digitised shape is the editable, parametric CAD model. In CAD, the sphere is described by parametric features which are easily edited by changing a value (e.g., centre point and radius). These CAD models describe not simply the envelope or shape of the object, but CAD models also embody the "design intent" (i.e., critical features and their relationship to other features). An example of design intent not evident in the shape alone might be a brake drum's lug bolts, which must be concentric with the hole in the centre of the drum. This knowledge would drive the sequence and method of creating the CAD model; a designer with an awareness of this relationship would not design the lug bolts referenced to the outside diameter, but instead, to the center. A modeler creating a CAD model will want to include both Shape and design intent in the complete CAD model. Vendors offer different approaches to getting to the parametric CAD model. Some export the NURBS surfaces and leave it to the CAD designer to complete the model in CAD (e.g., Geomagic, Imageware, Rhino 3D). Others use the scan data to create an editable and verifiable feature based model that is imported into CAD with full feature tree intact, yielding a complete, native CAD model, capturing both shape and design intent (e.g. Geomagic, Rapidform). Still other CAD applications are robust enough to manipulate limited points or polygon models within the CAD environment (e.g., CATIA, AutoCAD, Revit). Volume rendering: Different parts of an object usually have different threshold values or greyscale densities. From this, a 3-dimensional model can be constructed and displayed on screen. Multiple models can be constructed from various thresholds, allowing different colours to represent each component of the object. Volume rendering is usually only used for visualisation of the scanned object. Image segmentation: Where different structures have similar threshold/greyscale values, it can become impossible to separate them simply by adjusting volume rendering parameters. The solution is called segmentation, a manual or automatic procedure that can remove the unwanted structures from the image. Image segmentation software usually allows export of the segmented structures in CAD or STL format for further manipulation. Image-based meshing: When using 3D image data for computational analysis (e.g. CFD and FEA), simply segmenting the data and meshing from CAD can become time consuming, and virtually intractable for the complex topologies typical of image data. The solution is called image-based meshing, an automated process of generating an accurate and realistic geometrical description of the scan data. Laser scanning describes the general method to sample or scan a surface using laser technology. Several areas of application exist that mainly differ in the power of the lasers that are used, and in the results of the scanning process. Low laser power is used when the scanned surface doesn't have to be influenced, e.g. when it only has to be digitised. Confocal or 3D laser scanning are methods to get information about the scanned surface. Another low-power application uses structured light projection systems for solar cell flatness metrology, enabling stress calculation throughout in excess of 2000 wafers per hour. The laser power used for laser scanning equipment in industrial applications is typically less than 1W. The power level is usually on the order of 200 mW or less but sometimes more. Robotic control: e.g. a laser scanner may function as the "eye" of a robot. Establishing a bench mark of pre-existing shape/state in order to detect structural changes resulting from exposure to extreme loadings such as earthquake, vessel/truck impact or fire. Create GIS (geographic information system) maps and geomatics. Subsurface laser scanning in mines and Karst voids. 3D scanners are used by the entertainment industry to create digital 3D models for movies, video games and leisure purposes. They are heavily utilised in virtual cinematography. In cases where a real-world equivalent of a model exists, it is much faster to scan the real-world object than to manually create a model using 3D modeling software. Frequently, artists sculpt physical models of what they want and scan them into digital form rather than directly creating digital models on a computer. 3D selfie in 1:20 scale printed by Shapeways using gypsum-based printing, created by Madurodam miniature park from 2D pictures taken at its Fantasitron photo booth. 3D scanners are evolving for the use of cameras to represent 3D objects in an accurate manner. Companies are emerging since 2010 that create 3D portraits of people (3D figurines or 3D selfies). Reverse engineering of a mechanical component requires a precise digital model of the objects to be reproduced. Rather than a set of points a precise digital model can be represented by a polygon mesh, a set of flat or curved NURBS surfaces, or ideally for mechanical components, a CAD solid model. A 3D scanner can be used to digitise free-form or gradually changing shaped components as well as prismatic geometries whereas a coordinate measuring machine is usually used only to determine simple dimensions of a highly prismatic model. These data points are then processed to create a usable digital model, usually using specialized reverse engineering software. Land or buildings can be scanned into a 3d model, which allows buyers to tour and inspect the property remotely, anywhere, without having to be present at the property. There is already at least one company providing 3d-scanned virtual real estate tours. A typical virtual tour would consist of dollhouse view, inside view, as well as a floor plan. The environment at a place of interest can be captured and converted into a 3D model. This model can then be explored by the public, either through a VR interface or a traditional "2D" interface. This allows the user to explore locations which are inconvenient for travel. There have been many research projects undertaken via the scanning of historical sites and artifacts both for documentation and analysis purposes. The combined use of 3D scanning and 3D printing technologies allows the replication of real objects without the use of traditional plaster casting techniques, that in many cases can be too invasive for being performed on precious or delicate cultural heritage artifacts. In an example of a typical application scenario, a gargoyle model was digitally acquired using a 3D scanner and the produced 3D data was processed using MeshLab. The resulting digital 3D model was fed to a rapid prototyping machine to create a real resin replica of the original object. In 1999, two different research groups started scanning Michelangelo's statues. Stanford University with a group led by Marc Levoy used a custom laser triangulation scanner built by Cyberware to scan Michelangelo's statues in Florence, notably the David, the Prigioni and the four statues in The Medici Chapel. The scans produced a data point density of one sample per 0.25 mm, detailed enough to see Michelangelo's chisel marks. These detailed scans produced a large amount of data (up to 32 gigabytes) and processing the data from his scans took 5 months. Approximately in the same period a research group from IBM, led by H. Rushmeier and F. Bernardini scanned the Pietà of Florence acquiring both geometric and colour details. The digital model, result of the Stanford scanning campaign, was thoroughly used in the 2004 subsequent restoration of the statue. In 2002, David Luebke, et al. scanned Thomas Jefferson's Monticello. A commercial time of flight laser scanner, the DeltaSphere 3000, was used. The scanner data was later combined with colour data from digital photographs to create the Virtual Monticello, and the Jefferson's Cabinet exhibits in the New Orleans Museum of Art in 2003. The Virtual Monticello exhibit simulated a window looking into Jefferson's Library. The exhibit consisted of a rear projection display on a wall and a pair of stereo glasses for the viewer. The glasses, combined with polarised projectors, provided a 3D effect. Position tracking hardware on the glasses allowed the display to adapt as the viewer moves around, creating the illusion that the display is actually a hole in the wall looking into Jefferson's Library. The Jefferson's Cabinet exhibit was a barrier stereogram (essentially a non-active hologram that appears different from different angles) of Jefferson's Cabinet. In 2003, Subodh Kumar, et al. undertook the 3D scanning of ancient cuneiform tablets. Again, a laser triangulation scanner was used. The tablets were scanned on a regular grid pattern at a resolution of 0.025 mm (0.00098 in). A 2009 CyArk 3D scanning project at Uganda's historic Kasubi Tombs, a UNESCO World Heritage Site, using a Leica HDS 4500, produced detailed architectural models of Muzibu Azaala Mpanga, the main building at the complex and tomb of the Kabakas (Kings) of Uganda. A fire on March 16, 2010, burned down much of the Muzibu Azaala Mpanga structure, and reconstruction work is likely to lean heavily upon the dataset produced by the 3D scan mission. In 2005, Gabriele Guidi, et al. scanned the "Plastico di Roma antica", a model of Rome created in the last century. Neither the triangulation method, nor the time of flight method satisfied the requirements of this project because the item to be scanned was both large and contained small details. They found though, that a modulated light scanner was able to provide both the ability to scan an object the size of the model and the accuracy that was needed. The modulated light scanner was supplemented by a triangulation scanner which was used to scan some parts of the model. The 3D Encounters Project at the Petrie Museum of Egyptian Archaeology aims to use 3D laser scanning to create a high quality 3D image library of artefacts and enable digital travelling exhibitions of fragile Egyptian artefacts, English Heritage has investigated the use of 3D laser scanning for a wide range of applications to gain archaeological and condition data, and the National Conservation Centre in Liverpool has also produced 3D laser scans on commission, including portable object and in situ scans of archaeological sites. The Smithsonian Institution has a project called Smithsonian X 3D notable for the breadth of types of 3D objects they are attempting to scan. These include small objects such as insects and flowers, to human sized objects such as Amelia Earhart's Flight Suit to room sized objects such as the Gunboat Philadelphia to historic sites such as Liang Bua in Indonesia. Also of note the data from these scans is being made available to the public for free and downloadable in several data formats. 3D scanners are used to capture the 3D shape of a patient in orthotics and dentistry. It gradually supplants tedious plaster cast. CAD/CAM software are then used to design and manufacture the orthosis, prosthesis or dental implants. Many Chairside dental CAD/CAM systems and Dental Laboratory CAD/CAM systems use 3D Scanner technologies to capture the 3D surface of a dental preparation (either in vivo or in vitro), in order to produce a restoration digitally using CAD software and ultimately produce the final restoration using a CAM technology (such as a CNC milling machine, or 3D printer). The chairside systems are designed to facilitate the 3D scanning of a preparation in vivo and produce the restoration (such as a Crown, Onlay, Inlay or Veneer). The digitalisation of real-world objects is of vital importance in various application domains. This method is especially applied in industrial quality assurance to measure the geometric dimension accuracy. Industrial processes such as assembly are complex, highly automated and typically based on CAD (Computer Aided Design) data. The problem is that the same degree of automation is also required for quality assurance. It is, for example, a very complex task to assemble a modern car, since it consists of many parts that must fit together at the very end of the production line. The optimal performance of this process is guaranteed by quality assurance systems. Especially the geometry of the metal parts must be checked in order to assure that they have the correct dimensions, fit together and finally work reliably. Within highly automated processes, the resulting geometric measures are transferred to machines that manufacture the desired objects. Due to mechanical uncertainties and abrasions, the result may differ from its digital nominal. In order to automatically capture and evaluate these deviations, the manufactured part must be digitised as well. For this purpose, 3D scanners are applied to generate point samples from the object's surface which are finally compared against the nominal data. The process of comparing 3D data against a CAD model is referred to as CAD-Compare, and can be a useful technique for applications such as determining wear patterns on moulds and tooling, determining accuracy of final build, analysing gap and flush, or analysing highly complex sculpted surfaces. At present, laser triangulation scanners, structured light and contact scanning are the predominant technologies employed for industrial purposes, with contact scanning remaining the slowest, but overall most accurate option. Nevertheless, 3D scanning technology offers distinct advantages compared to traditional touch probe measurements. White-light or laser scanners accurately digitize objects all around, capturing fine details and freeform surfaces without reference points or spray. The entire surface is covered at record speed without the risk of damaging the part. Graphic comparison charts illustrate geometric deviations of full object level, providing deeper insights into potential causes. ^ Izadi, Shahram, et al. "KinectFusion: real-time 3D reconstruction and interaction using a moving depth camera." Proceedings of the 24th annual ACM symposium on User interface software and technology. ACM, 2011. ^ Moeslund, Thomas B., and Erik Granum. "A survey of computer vision-based human motion capture." Computer vision and image understanding 81.3 (2001): 231-268. ^ Wand, Michael et al. “Efficient reconstruction of nonrigid shape and motion from real-time 3D scanner data.” ACM Trans. Graph. 28 (2009): 15:1-15:15. ^ Biswas, Kanad K., and Saurav Kumar Basu. "Gesture recognition using Microsoft kinect®." Automation, Robotics and Applications (ICARA), 2011 5th International Conference on. IEEE, 2011. ^ Fausto Bernardini, Holly E. Rushmeier (2002). "The 3D Model Acquisition Pipeline" (PDF). Comput. Graph. Forum. 21 (2): 149–172. doi:10.1111/1467-8659.00574. ^ Brian Curless (November 2000). "From Range Scans to 3D Models". ACM SIGGRAPH Computer Graphics. 33 (4): 38–41. doi:10.1145/345370.345399. ^ Vermeulen, M. M. P. A., Rosielle, P. C. J. N., & Schellekens, P. H. J. (1998). Design of a high-precision 3D-coordinate measuring machine. CIRP Annals-Manufacturing Technology, 47(1), 447-450. ^ Cui, Y., Schuon, S., Chan, D., Thrun, S., & Theobalt, C. (2010, June). 3D shape scanning with a time-of-flight camera. In Computer Vision and Pattern Recognition (CVPR), 2010 IEEE Conference on (pp. 1173-1180). IEEE. ^ Franca, J. G. D., Gazziro, M. A., Ide, A. N., & Saito, J. H. (2005, September). A 3D scanning system based on laser triangulation and variable field of view. In Image Processing, 2005. ICIP 2005. IEEE International Conference on (Vol. 1, pp. I-425). IEEE. ^ Roy Mayer (1999). Scientific Canadian: Invention and Innovation From Canada's National Research Council. Vancouver: Raincoast Books. ISBN 978-1-55192-266-9. OCLC 41347212. ^ François Blais; Michel Picard; Guy Godin (6–9 September 2004). "Accurate 3D acquisition of freely moving objects". 2nd International Symposium on 3D Data Processing, Visualisation, and Transmission, 3DPVT 2004, Thessaloniki, Greece. Los Alamitos, CA: IEEE Computer Society. pp. 422–9. ISBN 0-7695-2223-8. ^ Salil Goel; Bharat Lohani (2014). "A Motion Correction Technique for Laser Scanning of Moving Objects". IEEE Geoscience and Remote Sensing Letters: 225–228. ^ Sirat, G., & Psaltis, D. (1985). Conoscopic holography. Optics letters, 10(1), 4-6. ^ K. H. Strobl; E. Mair; T. Bodenmüller; S. Kielhöfer; W. Sepp; M. Suppa; D. Burschka; G. Hirzinger (2009). "The Self-Referenced DLR 3D-Modeler" (PDF). Proceedings of the IEEE/RSJ International Conference on Intelligent Robots and Systems (IROS 2009), St. Louis, MO, USA. pp. 21–28. ^ K. H. Strobl; E. Mair; G. Hirzinger (2011). "Image-Based Pose Estimation for 3-D Modeling in Rapid, Hand-Held Motion" (PDF). Proceedings of the IEEE International Conference on Robotics and Automation (ICRA 2011), Shanghai, China. pp. 2593–2600. ^ Trost, D. (1999). U.S. Patent No. 5,957,915. Washington, DC: U.S. Patent and Trademark Office. ^ Song Zhang; Peisen Huang (2006). "High-resolution, real-time 3-D shape measurement". Optical Engineering: 123601. ^ Kai Liu; Yongchang Wang; Daniel L. Lau; Qi Hao; Laurence G. Hassebrook (2010). "Dual-frequency pattern scheme for high-speed 3-D shape measurement" (PDF). Optics Express. 18 (5): 5229–5244. doi:10.1364/OE.18.005229. PMID 20389536. ^ Song Zhang; Daniel van der Weide; James H. Oliver (2010). "Superfast phase-shifting method for 3-D shape measurement". Optics Express. 18 (9): 9684–9689. doi:10.1364/OE.18.009684. PMID 20588818. ^ Yajun Wang; Song Zhang (2011). "Superfast multifrequency phase-shifting technique with optimal pulse width modulation". Optics Express. 19 (6): 9684–9689. doi:10.1364/OE.19.005149. PMID 21445150. ^ "Glossary of 3d technology terms". ^ W. J. Walecki; F. Szondy; M. M. Hilali (2008). "Fast in-line surface topography metrology enabling stress calculation for solar cell manufacturing allowing throughput in excess of 2000 wafers per hour". Meas. Sci. Technol. 19 (2): 025302. doi:10.1088/0957-0233/19/2/025302. ^ Larsson, Sören; Kjellander, J.A.P. (2006). "Motion control and data capturing for laser scanning with an industrial robot". Robotics and Autonomous Systems. 54 (6): 453–460. doi:10.1016/j.robot.2006.02.002. ^ Remondino, Fabio. "Heritage recording and 3D modeling with photogrammetry and 3D scanning." Remote Sensing 3.6 (2011): 1104-1138. ^ Bewley, A.; et al. "Real-time volume estimation of a dragline payload" (PDF). IEEE International Conference on Robotics and Automation. 2011: 1571–1576. ^ Management Association, Information Resources (30 September 2012). Geographic Information Systems: Concepts, Methodologies, Tools, and Applications: Concepts, Methodologies, Tools, and Applications. IGI Global. ISBN 978-1-4666-2039-1. ^ Murphy, Liam. "Case Study: Old Mine Workings". Subsurface Laser Scanning Case Studies. Liam Murphy. Archived from the original on 2012-04-18. Retrieved 11 January 2012. ^ Curless, B., & Seitz, S. (2000). 3D Photography. Course Notes for SIGGRAPH 2000. ^ Lamine Mahdjoubi; Cletus Moobela; Richard Laing (December 2013). "Providing real-estate services through the integration of 3D laser scanning and building information modelling". Computers in Industry. 64 (9): 1272. doi:10.1016/j.compind.2013.09.003. ^ "Matterport Surpasses 70 Million Global Visits and Celebrates Explosive Growth of 3D and Virtual Reality Spaces". Market Watch. Market Watch. Retrieved 19 December 2016. ^ "The VR Glossary". Retrieved 26 April 2017. ^ Daniel A. Guttentag (October 2010). "Virtual reality: Applications and implications for tourism". Tourism Management. 31 (5): 637–651. doi:10.1016/j.tourman.2009.07.003. ^ Paolo Cignoni; Roberto Scopigno (June 2008). "Sampled 3D models for CH applications: A viable and enabling new medium or just a technological exercise?" (PDF). ACM Journal on Computing and Cultural Heritage. 1 (1): 1–23. doi:10.1145/1367080.1367082. ^ Scopigno, R.; Cignoni, P.; Pietroni, N.; Callieri, M.; Dellepiane, M. (November 2015). "Digital Fabrication Techniques for Cultural Heritage: A Survey". Computer Graphics Forum. 36: 6–21. doi:10.1111/cgf.12781. ^ Marc Levoy; Kari Pulli; Brian Curless; Szymon Rusinkiewicz; David Koller; Lucas Pereira; Matt Ginzton; Sean Anderson; James Davis; Jeremy Ginsberg; Jonathan Shade; Duane Fulk (2000). "The Digital Michelangelo Project: 3D Scanning of Large Statues" (PDF). Proceedings of the 27th annual conference on Computer graphics and interactive techniques. pp. 131–144. ^ Roberto Scopigno; Susanna Bracci; Falletti, Franca; Mauro Matteini (2004). Exploring David. Diagnostic Tests and State of Conservation. Gruppo Editoriale Giunti. ISBN 978-88-09-03325-2. ^ David Luebke; Christopher Lutz; Rui Wang; Cliff Woolley (2002). "Scanning Monticello". ^ Subodh Kumar; Dean Snyder; Donald Duncan; Jonathan Cohen; Jerry Cooper (6–10 October 2003). "Digital Preservation of Ancient Cuneiform Tablets Using 3D-Scanning". 4th International Conference on 3-D Digital Imaging and Modeling : 3DIM 2003, Banff, Alberta, Canada. Los Alamitos, CA: IEEE Computer Society. pp. 326–333. ^ Scott Cedarleaf (2010). "Royal Kasubi Tombs Destroyed in Fire". CyArk Blog. Archived from the original on 2010-03-30. Retrieved 2010-04-22. ^ Gabriele Guidi; Laura Micoli; Michele Russo; Bernard Frischer; Monica De Simone; Alessandro Spinetti; Luca Carosso (13–16 June 2005). "3D digitisation of a large model of imperial Rome". 5th international conference on 3-D digital imaging and modeling : 3DIM 2005, Ottawa, Ontario, Canada. Los Alamitos, CA: IEEE Computer Society. pp. 565–572. ISBN 0-7695-2327-7. ^ Payne, Emma Marie (2012). "Imaging Techniques in Conservation". Journal of Conservation and Museum Studies. Ubiquity Press. 10 (2): 17–29. doi:10.5334/jcms.1021201. ^ Christian Teutsch (2007). Model-based Analysis and Evaluation of Point Sets from Optical 3D Laser Scanners (PhD thesis). ^ "3D scanning technologies". Retrieved 2016-09-15.